The measurements made in Finland in 2017 show that the infrasound of wind power plants propagates to a distance of 15–20 km in almost all circumstances. Certain atmospheric conditions advances the propagation of infrasound to much larger areas, according to Marchillo et al. (2015) to distances up to 90 km from the wind power plants. These measurements were done of 60 wind turbines of 1.6 MW each. The approximate efficiency of the wind turbines in Finland was already 3.5 MW towards the end of 2017. The pilot study about damage caused by infrasound of wind turbines was carried out by the Finnish Association for Environmental Health (SYTe) in the spring 2016. According to its results the symptoms of inhabitants were reduced significantly not until more than 15–20 km from wind power plants. The data of the pilot study was collected 0.5–1.5 years after erection of wind power plants to the areas. 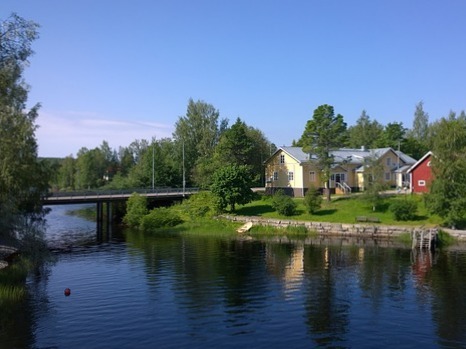 The pilot study and its results describe the situation in Satakunta and Northern Ostrobothnia in Finland in the spring 2016. The installed capacity of wind power was at that time almost 1500 MW in Finland. Figure 1 models the propagation of infrasound of wind turbines in the beginning of July, 2016. Figures 1 and 2. The models of the propagation of infrasound, stand 7-1-2016 and 12-31-2017. Since then the installed capacity of wind power in Finland increased sharply till the end of 2017 when it was about 2000 MW. Also the infrasound emission of wind power plants has increased. Figure 2 models the situation in the end of 2017. Large areas between wind parks, which had previously been free of infrasound, have been covered by industrial infrasound. It has been found out based on infrasound measurements made in different parts of Finland during 2017 that the infrasound propagates to a distance of 15–20 km in almost all circumstances. It is known, however, that certain times of day and atmospheric conditions advance the propagation of infrasound even to larger areas than this. According to Marchillo et al. (2015) the infrasound of wind power plants propagates under favorable conditions to distances up to 90 km from wind power plants. These measurements were made in an area of 60 wind turbines in New Mexico, USA. The efficiency of these wind turbines was 1.6 MW each. The approximate efficiency of the wind power plants erected in Finland was over 3 MW in 2016 and almost 3.5 MW in the end of 2017. How large is the area to which the infrasound produced by them propagates? The noise and infrasound exposure has continued already for years in Finland, from the beginning of 2016 or even longer. In the meantime, the area covered by industrial infrasound has become larger and even more people have been and are exposed to infrasound pulses. Even if only a part of the inhabitants would have symptoms or would be aware of the reason of the symptoms, everybody living or working in this area is exposed to infrasound. 22.3.2019 (English translation revised 22.3.2019).